The leaderboard's volatile down at the Emirates Australian Open. The winds are swirling and gusting around the Australian Golf Club in Sydney, and the players are struggling. Nearly 25 players were under par when the third round started; as I write this, a mere 7 players are in the red. The wind has knocked some really nice shots right out of the air at the green, even when the pin appears to be fairly calm. At the other end of the spectrum, Rory McIlroy went triple-double on 9 and 10, dropping to +1 where he's spent most of the round since. Rory hit a drive into some nasty hay on the par-4 9th, tried to hit it out (there was no good drop available) and he drove it down into the sand, and had to take a drop anyway. That shot went way right and, despite a good shot over a tree to the green, he needed 2 putts for his 7. He managed to make a bounceback birdie on the 11th, but dropped another shot at 13. He's still +5 for the day. Adam Scott has been battling away since a horrible start in the first round. He's currently tied with Pampling and Jordan Spieth -- who's played amazingly well for his first time on an Australian sandbelt course, even leading periodically -- at -4. 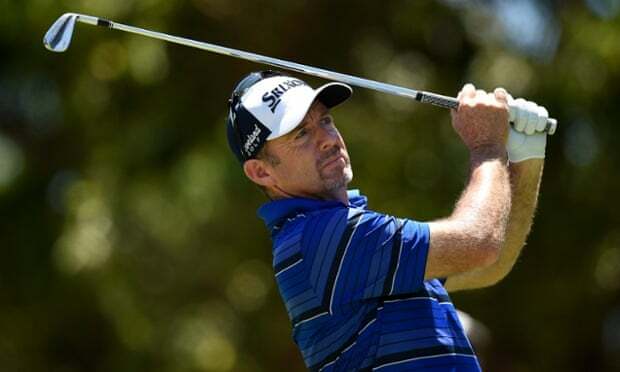 Currently Brett Rumford and Greg Chalmers -- you likely recognize both of those names, as they've played the PGA Tour quite a bit -- lead at that magical total of -5. It's only -5 after 3 full rounds of golf, the same that it was after the second round.. and the first round. THAT's how tough the course is playing. The final round tonight should be quite a shootout. Nobody's gonna run away with this one!